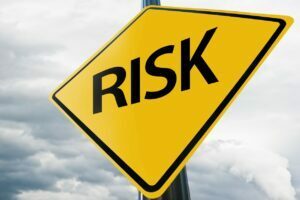 How much risk do you want in your retirement portfolio, and exactly how much risk do you actually have? If you are approaching retirement, no doubt you’re concerned about your investments and ensuring you have enough money to take care of your financial and health needs. As you get older, a wise investment strategy should work to minimize your risk so you don’t deplete your savings if the market turns sour. However, it’s not always easy to analyze and determine your current risk. At Stuart Estate Planning Wealth Advisors, we conduct an in-depth Portfolio Risk Analysis with a Nobel prize-winning-based software that reviews your current investments and reveals the actual level of risk that you are exposed to today. This allows you to make adjustments now to help protect your assets and weather any market downturns. The stock market has seen record highs in the last several years, but some experts think we could be due for a correction. What potentially could happen to your investments if we experienced another volatile period, such as the tech bubble that occurred in the 1990s or the real estate crash in 2008? It makes sense to hope for the best – while taking some advantage of returns from the market – but plan for the worst. What goes into a Portfolio Risk Analysis? At Stuart Estate Planning Wealth Advisors, we analyze all of your current investments, including stocks, mutual funds, bonds, ETFs and annuities. Using specialized software, we determine your “Risk Number” on a scale of 1 to 99… 1 being all cash and 99 having all your investments in an aggressive stock. Assigning a specific number can help give you a better picture of your true circumstances. Many investment companies use generic terms like “aggressive,” “moderate” or “conservative” to assess risk, but these words don’t sufficiently describe an investor. Having an exact Risk Number builds a detailed framework that works for all investors. It’s not enough to create a portfolio and then never look back, of course. It is essential to monitor your investments to ensure the risk doesn’t increase based on market factors – potentially causing you to sustain losses that could jeopardize your finances in retirement. Once we have your Ideal Risk Number, we manage your portfolio over time to keep you at that appropriate number. Each quarter, we rebalance your portfolio to take advantage of new opportunities, reflect market trends and attempt to avoid losses. The market changes all the time, and there are often trends that indicate an upturn or downturn. We use market-based indicators to continually adjust your portfolio. We classify the market indicators as “negative,” “neutral” or “positive.” When negative indicators increase, we adjust a portfolio to have less stock exposure. When indicators are positive, we may increase stock market investment. Another service we provide is running a “Historical Volatility Analysis,” also known as a stress test. This measures how much you could make in a strong market versus how much you stand to lose in bad times. We also run a portfolio fee analysis, which looks at how much you’re paying in mutual fund and variable annuity fees. Many investors pay little attention to things like fees (hidden or otherwise), but they can be substantial and add up to a lot of money – effectively tanking true return on investment if you’re not careful. After all of these reviews, we create a Personalized Risk Analysis Report that is customized for you and your needs. Why would you want to have a Risk Analysis Report done? You’re a do-it-yourself investor, but now you want a professionally managed plan that is designed to preserve and protect your wealth. You’ve been working with one or more brokers and you want a second opinion. You’re afraid you have too much risk or you want to ensure you’re not paying too much in fees. Reviewing your financial future and ensuring your wealth is protected can be crucial, especially if you’re retired and want to help ensure income-generating wealth that can be passed on to your loved ones as your legacy. Learn more by attending an upcoming complimentary dinner workshop at Ruth’s Chris or Abe & Louie’s Steakhouse in Boca Raton or Fort Lauderdale. This workshop is best suited for those over age 60 with between $500,000 to $10,000,000 in investable assets. Call our office to register now at 1-800-807-5558. 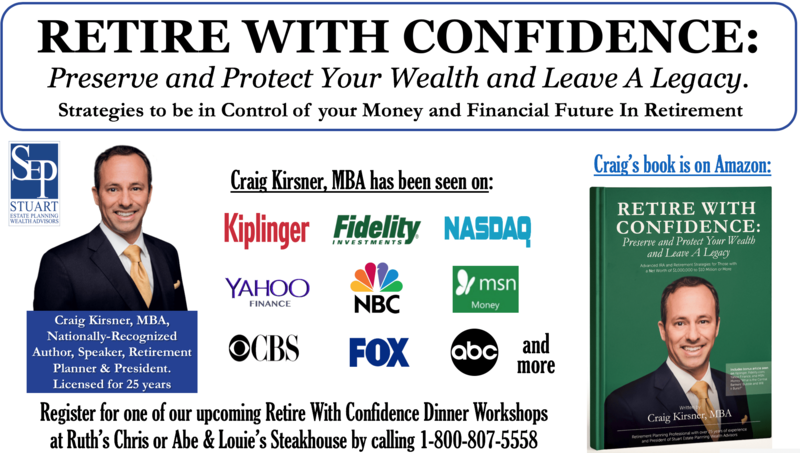 Craig Kirsner, MBA, is a nationally-recognized Author, Speaker, and Retirement Planner, whom you may have seen on Kiplinger, CBS, ABC, NBC, Fox, Fidelity.com, MSN Money, Yahoo Finance, and others. Craig is the author of Retire With Confidence: Preserve and Protect Your Wealth And Leave A Legacy and is the creator of the Preserve and Protect Retirement System.